Israeli forces demolished Palestinian houses and sheep barns in Zera'a 'Awad in the Northern Jordan Valley, northeast of Nablus. Israeli forces have continued with systematic attacks against Palestinian civilians and their property in the occupied Palestinian territories (oPt) for the reporting period of 04- 10 June 2015. Israeli forces continued to use force against Palestinian civilians participating in peaceful protests in the oPt and against fishers sailing within the allowed area in the Gaza Strip sea. During the reporting period, Israeli forces killed a Palestinian civilian in Jenin refugee camp in the north of the West Bank, and wounded 9 others, including 2 children, in the West Bank and Gaza Strip.In the Gaza Strip, Israeli forces continued to target and chase fishermen, moreover, Israeli warplanes carried out 3 airstrikes against training sites belonging to Palestinian armed groups. In the West Bank, on Wednesday, 10 June 2015, Israeli forces killed a Palestinian civilian in Jenin refugee camp, west of Jenin. They claimed that Israeli soldiers moved into the said refugee camp to arrest wanted persons, but while withdrawing, they noticed a young Palestinian man, who was trying to throw an explosive device at an Israeli patrol. As a result, an Israeli officer fired at him, due to which the device exploded near the young man before he could throw it. Israeli forces continued to use excessive and systematic use of force against peaceful protests organized by Palestinian civilians and Israeli and international human rights activists in protest atthe construction of the annexation wall and settlement activities in the West Bank and Israeli policies in the oPt. As a result, 7 civilians, including a child, were wounded. In the Gaza Strip, 2 Palestinian fishers, including a child, sustained bullet wounds on 04 June 2015, when Israeli gunboats opened fire at a fishing boat sailing off al-Sudaniya shore in the north of the Gaza Strip. There were 5 fishers on board of the boat. Israeli navy forces arrested all of them and confiscated the boat. After they were released, it was found that 2 of whom sustained bullet wounds, but their wounds were minor. In the context of targeting fishers, in addition to the abovementioned attack on fishermen,Israeli navy forces opened fire thrice at fishermen sailing in the allowed area. Moreover, Israeli warplanes carried out 3 airstrikes at training sites belonging to Palestinian armed groups. On 04 June 2014, Israeli warplanes attacked al-Yarmouk site, west of al-Maqousi buildings, north of Gaza City, and Abu Jarad site, south of al-Zaitoun neighborhood in the south of the city. On 07 June 2015, Israeli warplanes attacked Palestine site 500 meters away from the border fence, southwest of Beit Hanoun (Erez) crossing in the north of the Gaza Strip. As a result, material damage but no casualties were reported. During the reporting period,Israeli forces conducted at least 70 military incursions into Palestinian communities in the West Bank and 4 ones in East Jerusalem.During these incursions, Israeli forces arrested at least 53Palestinians, including 7 children and a woman. Fourteen of these Palestinians, including 6 children, were arrested in East Jerusalem. During the reporting period, Israeli forces confiscated NIS 4,300 from the house of prisoner Khader al-Sourkaji (38) and a car claiming that the money would be used for terrorist purposes. In the Gaza Strip, on 05 June 2015, Israeli forces conducted a limited incursion in the east of Jabalia in the north of the Gaza Strip. They levelled land along the border fence. On 10 June 2015, Israeli forces moved about 150 meters in the east of al-Qarara village, east of Khan Yunis in the south of the Gaza Strip. This coincided with a similar incursion in the east of Khuza'a village, where Israeli forces levelled lands along the border fence and withdrew later. This resulted in grave violations of the economic, social and cultural rights and a deterioration of living conditions for 1.8 million people. The Israeli authorities have established Karm Abu Salem (KeremShaloum) as the sole crossing for imports and exports in order to exercise its control over the Gaza Strip’s economy. They also aim at imposing a complete ban on the Gaza Strip’s exports. The Israeli closure raised the rate of poverty to 38.8%, 21.1% of which suffer from extreme poverty. Moreover, the rate of unemployment increased up to 44%, which reflects the unprecedented economic deterioration in the Gaza Strip. On 09 June 2015, the Israeli forces bulldozed 3 industrial establishments in al-Khalaila neighbourhood in al-Jeeb area, northwest of Jerusalem,under the pretext of non-licensing. Mr. Isma'il Abu Rabah, Head of the neighbourhood's council, said that Israeli bulldozers moved into the neighbourhood around 06:30. They demolished 3 industrial facilities, including a metal workshop belonging to Abdullah al-Keswani and 2 auto repair garages belonging to Nour al-Matari and Mohanned Mansour.He also mentioned that the workshop supports more than 20 persons while the garages support 6 families. On 10 June 2015, the Israeli forces bulldozed an agricultural land in al-Isawiya village, northeast of Jerusalem, and destroyed the buildings on it. They bulldozed an agricultural room, a kitchen, a bathroom, a water well, and the surrounding fences. They also uprooted more than 70 trees. The land has an overall area of 8 dunums and 50 square meters and belongs to the deceased Sabri Yahya Darwich. On 04 June 2015, Israeli forces destroyed a land belonging to Ahmed Abdel Aziz Ghuneimat (86) inSha'ab al-Seif area to the west of Sorif village, northwest of Hebron. They bulldozed the stone chains and barbwire in the 30-dunum land. They also buried two water wells and uprooted and confiscated 200 olive trees and 200 almond trees. It should be noted that the Israeli forces handed notices on 31 August 2015 ordering the confiscation of 4,000 dunums of village lands claiming they were state properties, including the above- mentioned land. On the aforementioned day, the Israeli bulldozers destroyed 5 houses, 4 kitchens, 4 bathrooms, and 14 civilian establishments used as animal shelters in Thera' Awwad area in the northern mountains belonging to 4 Bedouin families of 29 members. One of the families lost a 350-gram gold ornament. 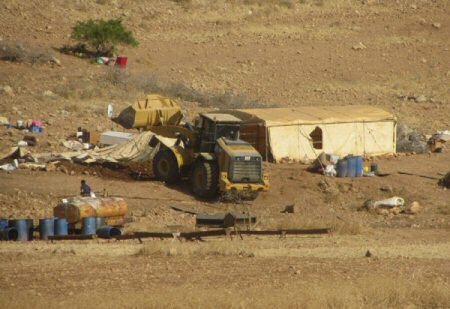 On 10 June 2015, the Israeli forces destroyed a residential tent of an area of 30 square meters belonging to Khail Abu Qbeita under the pretext of non-licensing in Esteir area, southeast of Yatta, south of Hebron. During the reporting period, Israeli soldiers used excessive force against peaceful demonstrations organized by Palestinian civilians, international and Israeli human rights defenders in protest at the construction of the annexation wall and settlement activities in the West Bank.As a result,7 civilians, including a 13-year-old child, were wounded. Following the Friday prayer, on 05June 2015, dozens of Palestinian civilians and international and Israeli human rights defenders organized a peaceful demonstration in Bil’in, west of Ramallah, in protest at the construction of the annexation wall and settlement activities and to mark the 48th anniversary of the 1967 war. The protestors marched by the annexation wall and tried to cross the fence. Israeli soldiers stationed behind the wall, in the western area, and a large number of soldiers deployed along it, fired live bullets, tear gas canisters, rubber-coated metal bullets, sound bombs and wastewater at them and chased them into the olive fields. As a result, a number of protestors suffered tear gas inhalation and others sustained bruises as they were beat up. Also following the Friday prayer, dozens of Palestinian civilians organised a peaceful demonstration in the centre of Ni’lin village, west of Ramallah, in protest at the construction of the annexation wall and settlement activitiesand to mark the 48th anniversary of the 1967 war. The demonstrators took the streets and headed to the annexation wall. Israeli forces closed the gates of the wall with barbwires and prevented the demonstrators from crossing to the land behind it before they responded by throwing stones. Israeli soldiers fired live ammunition, rubber-coated metal bullets, sound bombs and tear gas canisters at the civilians, and chased them into the village. As a result, a number of protestors suffered tear gas inhalation and others sustained bruises as they were beat up by Israeli soldiers. Also following the Friday prayer, dozens of Palestinian civilians and Israeli and international human rights defenders gathered in the center of al-Nabi Saleh village, northwest of Ramallah, to start the weekly peaceful protest against the construction of the annexation wall and settlement activitiesand to mark the 48th anniversary of the 1967 war. They made their way towards Palestinian lands that Israeli settlers from the nearby "Halmish" settlement are trying to seize. Israeli soldiers closed all the village's entrances to prevent the Palestinian and international solidarity activists and journalists from participating in the protest. As a result, a number of protestors suffered tear gas inhalation and others sustained bruises as they beat up by Israeli soldiers. Also following the Friday prayer, there was the weekly protest against the closure of the eastern entrance of Kufor Qaddoum village, which has been closed by Israeli forces since the Intifada. Once the protestors approached the closed entrance, Israeli forces fired rubber-coated metal bullets, tear gas canisters and sound bombs. They also sprayed skunk water other the protestors.As a result, a 46-year-old male sustained a bullet wound to the right leg. Following the Friday prayer, on 05June 2015,dozens of Palestinians gathered at the southern entrance of al-Jalazoun refugee camp, north of Ramallah, to protest at the Israeli practices against the Palestinian civilians and to mark the 48th anniversary of the 1967 war. They were about 300 meters away from the fence of "Beit Eil" settlement. Israeli forces stationed in the area fired live ammunition, rubber-coated metal bullets, sound bombs and tear gas canisters. As a result,a 19-year-old civilian sustained a bullet wound to the left knee and was taken to Palestine Medical Compound to receive medical treatment. Also ffollowing the Friday prayer, dozens of Palestinians gathered at the western entrance of the Silwad village, northeast of Ramallah, on the road between Silwad and Yabroud villages, near Bypass road (60), in protest at the Israeli policies. The protestors set fire to tires and threw stones and Molotov Cocktails at the aforementioned road and Israeli soldiers. In response, Israeli soldiers stationed in the area fired live ammunition, rubber-coated bullets, sound bombs and tear gas canisters at the protestors. As a result,3 civilians, including a child, were wounded. A 13-year-old Akram Jom'a Hammad sustained a bullet wound to the leftthigh, a 22-year-old civilian sustained a bullet wound to the right leg anda 25-year-old civilians sustained a bullet wound to the right leg. Also ffollowing the Friday prayer,dozens of youngsters gathered from different areas of Ramallah and al-Bireh in the vicinity of Ofer detention facility, southwest of Ramallah, to protest at Israeli policies. They headed towards the facility’s gate that was closed by Israeli soldiers. They set fire to tires and threw stones and empty bottles at the soldiers. Israeli forces deployed around the detention facility and started firing live and rubber-coated metal bullets, sound bombs and tear gas canisters. As a result,2 civilians sustained wounds and were taken to Palestine Medical Compound in Ramallah. A 40-year-old civilian sustained a bullet wound to the right thigh and was hit by a gas canister to the belly and a 25-year-old civilian sustained a bullet wound to the rightleg. At approximately 10:00 on Saturday, 06June 2015, a number of activists from the Popular Committees against Annexation Wall and Settlement Activities and other human rights activists organized a protest in front of "Beit Bracha" building, adjacent to bypass road (60) between al-Aroub refugee camp and Beit Ommar village, north of Hebron, because Israeli forces fixed a security fence and surveillance cameras around the building and its vicinity and declared it as part of "Gosh Etzion" settlement. Israeli officers and police surrounded the place, prevented the participants from approaching the main gate and attacked them. · Hebron: Israeli forces established 11 checkpoints all over the city. On Thursday, 04 June 2015, Israeli forces established 2 checkpoints at the northern entrance of Hebron, and at the entrance of Karmah village, southeast of Dura, southwest of Hebron. On Friday, 05 June 2015, Israeli forces established a checkpoint at the southern entrance of Halhoul, north of Hebron. OnSaturday, 06 June 2015, Israeli forces established 3 checkpoints at the entrance of Beit 'Awa village, south of Dura, southwest of Hebron; at the entrance of al-Hejrah village, east of Dura and at the entrance of Ethna village, west of Hebron. On Monday, 08 June 2015, Israeli forces established 3 checkpoints at the entrance of 'Aroub refugee camp, north of Hebron; at the entrance of al-Samou'a village, south of the city and at the northern entrance of Halhoul, north of the city. On Tuesday, 09 June 2015, Israeli forces established a checkpoint at the entrance of al-Fawar refugee camp, north of Hebron. On Wednesday, 10 June 2015, Israeli forces established a checkpoint at the entrance of Deir Samet village, north of Dura, northwest of Hebron. · Ramallah: Israeli forces established 8 checkpoints all over the city. On Thursday, 04June 2015, Israeli forces established 2 checkpoints at the entrance of 'Atarah Checkpoint at the northern entrance of Beir Zeit, north of Ramallah and at the intersection of Beit Or al-Foqa, southwest of Ramallah. On Friday, 5 June 2015, Israeli forces established 4 checkpoints at the entrance of al-Nabi Saleh village, at the entrance of Deir Abu Mesh’al village, northwest of Ramallah, at the entrance of Senjel village, north of Ramallah, and under the bridge of Yabrud village, northeast of the city. On Saturday, 06 June 2015, Israeli forces established 2 checkpoints at the entrance of al-Mogher village andthe entrance of Tiba town, northeast of Ramallah. · Qalqilya: Israeli forces established7 checkpoints all over the city. On Friday, 05June 2015, Israeli forces established two checkpoints at the entrance of Kafr Qaddoum, northeast of Qalqilya, and at the intersection of Jet village, northwest of Qalqilya. On Saturday, 07 June 2015, Israeli forces established a checkpoint at eastern entrance of Qalqilya City. On Sunday, 08 June 2015, Israeli forces established 4 checkpoints; two of them at the eastern entrance and the other two at the entrance of Kafr Qaddoum, northeast of Qalqilya, during the morning hours and evening hours. · Jenin: Israeli forces established 3 checkpoints all over the city.OnSaturday, 07 June 2015, Israeli forces established two checkpoints on the road between Kafirt village and Ya’bod town, southwest of Jenin, and at the road of the American University in al-Zababda, southeast of Jenin. On Sunday, 08 June 2015, Israeli forces established a checkpoint on the road between Kafirt village and Ya’bod town, southwest of Jenin. · Jericho: Israeli forces established 4 checkpoints all over the city. On Friday, 05June 2015, Israeli forces established 2 checkpointsat the entrance of Fasayel village, north of the city, and at the entrance of al-Zubaidat village, north of Jericho. On Saturday, 06 June 2015, Israeli forces established a checkpoint at the southern entrance of Jericho. · Tulkarm: Israeli forces have continued to impose severe restrictions on the movement of Palestinian civilians. On Friday, 5June 2015,Israeli forces stationed at ‘Annab military checkpoint which is established on the road between Tulkarm and Nablus, east of the city, tightened their restrictions against civilians and obstructed their movement. The tightening recurred at the aforementioned checkpoint. At approximately 8:00 on Saturday, 7 June 2015 and at approximately 19:00 on the aforementioned Saturday. At approximately 17:00, Israeli forces established a checkpoint at the entrance of Pharon village, south of Tulkarm. At approximately 17:00 on Thursday, 04 June 2015, Israeli forces established a checkpoint on the main road between Tulkarm and Qalqilya near the eastern entrance of Jabara village. They stopped a Palestinian car travelled by Mo’ath Mohammad Amen Esheikh Hussein (21) from Kafr Abosh village, northeast Qalqilia, and arrested him. At approximately 19:00 on the aforementioned Thursday, Israeli forces arrested former prisoner Saleh Mohammad Abed Arrahman Deria (39) from Beit Fojar town, while he was at the intersection of “Gosh Atsion” settlement, south of Bethlehem under the claim of having a knife and then took him to an unknown destination. It should be noted that Deria spent 12 years in the Israeli jails over two periods: the first was 5 years and the second was 7 years and he was released with a serious mental health problem and other diseases. Deria is married and has three children. At approximately 10:00 on Friday, 05 June 2015, Israeli forces deployed in the old town, center of Hebron City, arrested Muhammad Nader Qafesha (14) under the pretext of his disobedience to the soldiers. They transferred him to the police station of “Kiryat Aba’a”, east Hebron. At approximately 15:00 on Sunday, 07 June 2015, Israeli forces stationed at Nafaq checkpoint, west of Beit Lahem, arrested Ahmed Mahmoud Abed Assalam Alama (24) from Beit Amer town, North of Hebron, during his return from his work and then took him to unknown destination. At approximately 10:30 on Sunday, 07 June 2015, Israeli forces established a checkpoint at the entrance of Heja village, east Qalqilya. Before removing the checkpoint later, the Israeli soldiers arrested Omer Waleed Omer Borhom (30), from the neighboring Kafr Qaddom, while crossing the checkpoint and then took him to an unknown destination At approximately 14:00 on Wednesday, 10 June 2015, Israeli forces established a checkpoint at the entrance of Beit Amer town, north of Hebron City and before removing it, they arrested Ahmed Yaser Aza’qeq (24) after stopping his vehicle. On Tuesday, 09 June 2015, bulldozers of the Israeli municipality in East Jerusalem demolished 3 industrial facilities in al-Khalaila neighbourhood in al-Jaib village, northwest of East Jerusalem, under the pretext of non-licensing. Mr. Isma'il Abu Rabah, head of the neighbourhood's council, said that Israeli bulldozers moved into the neighbourhood around 06:30. They demolished 3 industrial facilities, including a metal workshop belonging to Abdullah al-Keswani and 2 auto repair garages belonging to Nour al-Matari and Mohanned Mansour. Abu Rabah said that Israeli bulldozers demolished the abovementioned workshop for the 4th time. It should be noted the workshop supports over 20 persons, while Mansour's garage supports 3 families. Abu Rabah pointed that Israeli forces demolished al-Matari garage for the second time. He stressed that licenses for construction and industrial facilities have been suspended for 30 years. At approximately 02:00 on Thursday, 04June 2015, Israeli forces raided moved into al-Mukaber Mount village, southeast of East Jerusalem. They raided and searched a number of houses from which they arrested Ata Mohammed Eweisat (42) and Ahmed Aziz Eweisat (23). At approximately 15:00, Israeli forces arrested Mohammed Abed al-A'wer (17) and Mahmoud Zaidan al-A'wer (16) while walking in Ein al-Louza neighbourhood in Silwan village, south of the old city in East Jerusalem. At approximately 14:00 on Friday, 05 June 2015, dozens of human rights defenders and Palestinian civilians from Shaikh Jarrah neighbourhood, north of the old city in East Jerusalem, organized a peaceful protest to mark the 48th anniversary of the 1967 war. They made their way in the streets near the houses that wereseized in the past days. They raised Palestinian flags and chanted slogans against settlement activities. Israeli forces moved into the neighbourhood and surrounded the protest. Moreover, they arrested Saleh Diab (32) and Ahmed Nasser Dawrwish (24) and took them to an unknown destination. At approximately 21:00 on Saturday, 06 June 2015, Israeli forces moved into Bab Hetta neighbourhood, in the old city in East Jerusalem. They raided and searched a number of houses from which they arrested Mo'aweya Abdullah al-Ajlouni (23) and Amir al-Baseti (17). At approximately 03:30 on Sunday, 07 June 2015, Israeli forces raided and searched a house belonging to Rabah Elayan in al-eisawiya village, north of East Jerusalem. They arrested his son Mohammed (21) and took him to an unknown destination. At approximately 13:00 on Sunday, 07 June 2015, Israeli forces arrested 3 Palestinian civilians while going out of al-Aqsa mosque in the old city in East Jerusalem. They took them to al-Qashala interrogation facility to be questioned. The arrested civilians were identified as: Esmat al-Hamouri (43), Ra'fat Najib (39); and Nidal Ahmed Seyam. At approximately 04:00 on Tuesday, 09 June 2015, Israeli forces moved into Beit Hanina neighbourhood, north of East Jerusalem. They raided and searched a number of houses from which they arrested 3 children: Karim Mahmoud Seyam (17); Ahmed Ali Yaseen (16); and Yusef Ahmed Eweida (16). On Thursday morning, 28 May 2015, Israeli forces closed the entrance of a room in the underground floor of the Ibrahimi mosque in the center of Hebron, for security reasons. They changed the door lock and refused to give its key to mosque servants. It should be noted that the room overlooks the yard that was established by settlers near the mosque. At approximately 13:30 on Tuesday, 02 June 2015, Israeli forces moved into Rummana village, northwest of Jenin. They deployed in Palestinian farmlands and informed farmers they had an order to bridge an artesian well and 2 agricultural rooms belonging to Fayadh Riyadh Fayad Sbaihat (35) under the pretext they were not licensed. An Israeli bulldozer demolished the well and rooms under Israeli forces' protection. They withdrew from the area and no more incidents were reported. At approximately 05:00 on Thursday, 04 June 2015, Israeli forces, backed by several military vehicles and accompanied by a vehicle belonging to the Construction and Organization Department in the "Civil Admiration", and four bulldozers, moved into Sha'ab al-Seif area to the west of Sorif village, northwest of Hebron. They stationed in a land belonging to Ahmed Abdel Aziz Ghuneimat (86) and they bulldozed the 30-dunum land and stone chains and 500 meters of barbwire. They also buried two water wells; the capacity of each is 80m3. Moreover, they uprooted 200 olive trees and 200 almond trees and confiscated them. It should be noted that the Israeli forces handed notices on 31 August 2015ordering the confiscation of 4,000 dunums of the village's lands claiming they were state property. The above-mentioned plot was included in the confiscation notices. "My father has approximately 30 dunums in Sha'ab al-Seif area to the west of Sorif village, west of Hebron. We rehabilitated the land through a project from the Agricultural Relief. We contributed with 20% of the land restoration process in addition to our efforts. The restoration cost us 120,000 NIS. We built stone chains and barbwire and dug two water wells; one of them was built with concrete. Furthermore, we planted the land with different seedlings. At approximately 05:30 on Thursday, 04 June 2015, one of my relatives called me and told me that Israeli military vehicles were stationed on our land. I headed tothe roof, which overlooks the land, and saw several vehicles and bulldozers. I headed there in my car and met the municipal director on the way. We tried to approach the land but the soldiers stopped us. After a long argument, the municipal director spoke with the Israeli officer who told us that there was a court order to confiscate the land. He suggested going to court in case we had an objection. At approximately, 19:00, the forces left the land and we found it wascompletely destroyed. They uprooted the seedlings and confiscated them. It should be noted that we did not receive any notices to stop working on the land." At approximately 07:00 on the aforementioned Thursday, the Israeli forces, backed by several military vehicles and accompanied by two bulldozers and two jeeps belonging to the Civil Administration, moved into the Thera' 'Awwad area in the northern mountains. They bulldozed a residential compound for Bedouin families in the area. They destroyed 5 houses, 4 kitchens, 4 bathrooms, and 14 civiliansestablishment used as barns and animal shelters. The property of 29 persons was bulldozed. One of the families lost a 350-gram gold ornament. 4. bulldozing a residential tent of an area of 60 square meters, a tin barrack of an area of 160 square meters, a tin kitchen of an area of 30 square meters, a mobile bathroom, an animal shelter of an area of 300 square meters, two tents used as animal shelters of an area of 240 square meters, 20 iron cutters, and a 350-gram gold ornament belonging to 'Adel Abdel Mahdi Salamin. At approximately 09:00 on Wednesday, 10 June 2015, the Israeli forces backed by two militaryvehicles and a vehicle, belonging to the Construction and Organization Department in the Civil Administration and a GCB bulldozer moved into Esteer area near Kherbat Minzil, southeast of Yatta, south of Hebron. They bulldozed a residential tent of an area of 30 square meters belonging to Khalil Muhammad Abu Qbeita under the pretext of illegal construction in area C.
Palestinian children and teenagers visiting Britain held a demonstration, yesterday, rallying against Palestinian child imprisonment by Israel in the West Bank and Israel. Cambridge news reported that the children were given a tour of King’s College, Cambridge, before leading a march through the city’s streets. They wore blindfolds and shackles during their march in order to raise awareness of the horrific circumstances many Palestinian detainees, including children, suffer through. One of the children (16) told his story of being shot by Israeli Occupation Forces (IOF) on his way home from school. Another (13) has a friend who was arrested at a protest and detained for 2 months without charge or trial. According to the PNN, there are currently 182 Palestinian minors locked up in Israeli jails, including 26 minors below the age of 16. 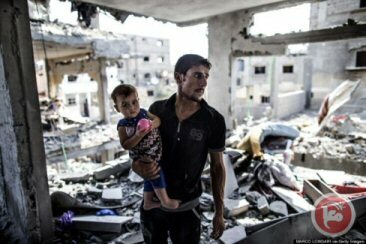 Meanwhile, Israel was dropped yesterday from a UN list of children’s rights violators, despite evidence presented to the UN concerning Israeli violations during the 2014 Israeli assault on Gaza. During this assault, 535 Palestinian children were killed, 3374 wounded and approximately 1000 left permanently disabled. The visit to Cambridge was organised by human rights charity Camden Abu Dis Friendship Association (CADFA) and funded by Erasmus and the European Union (EU). The group’s visit will end with a series of public events in London later this week. "We Bombed Civilians for Entertainment." Half of Gazans say they are considering emigration from the Gaza Strip, according to the Palestinian Center for Policy and Survey Research. AFP reports that the 50 percent of those polled in Gaza thinking of leaving the coastal enclave is the highest percentage ever recorded, amidst decreasing satisfaction of achievements attained by Hamas last summer's war. 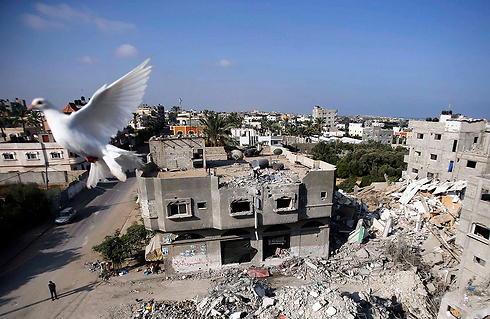 Increasing frustration comes the IMF reported last month that reconstruction since the most recent war between Israel and Hamas has been significantly lower than expected, while the World Bank reported that the strip was facing a "dangerous fiscal crisis". Unemployment in Gaza increased in 2014 "to reach 44 percent -- probably the highest in the world," the World Bank reported, with the poverty rate in the occupied Palestinian territory reaching 39 percent, despite the fact that nearly four of every five Gazans receive "some aid". "Gaza's unemployment and poverty figures are very troubling and the economic outlook is worrying," the World Bank quoted Palestinian territories director Steen Lau Jorgensen as saying in a statement. The UN has repeatedly warned of further conflict in the area if the reconstruction process continues at such slow pace, emphasizing that Gaza's humanitarian crisis is worsened by Israel's eight-year blockade on the Strip. Despite the new record high levels of desire for emigration from the war-ravaged strip, Gaza residents would still favor reelection of Gaza's governing party Hamas' Ismail Haniyeh to Fateh's leader Mahmoud Abbas, PSR polls also said in the June report. In the West Bank, however, the level of satisfaction with the performance of Abbas rose to 44 percent, compared to 40 percent three months prior. If new legislative elections were held today with the participation of all factions, 72 percent of Palestinians in the West Bank and Gaza Strip say they would participate. Of those who would participate, 35 percent say they would vote for Hamas and 39 percent say they would vote for Fatah, 11 percent would vote for all other third parties combined, and 16 percent are undecided. Elections have not been held since 2006 largely due to ongoing political divisions between Fateh and Hamas. "A super-enormous battle is being waged for the future of our society," said Sarit Michaeli, a spokeswoman for B'Tselem and a veteran activist who has spent years gathering evidence of alleged transgressions in the West Bank. "What we have here are many years of intense efforts to discredit Israel's human rights community, primarily related to our work exposing human rights violations." Amongst the projects to be hit are a mixed-race children's theatre that the actor, Norman Issa, runs near Tel Aviv. Issa said he felt he was being "extorted" over his political views. There are more than 30,000 NGOs registered in Israel, about half of them active. 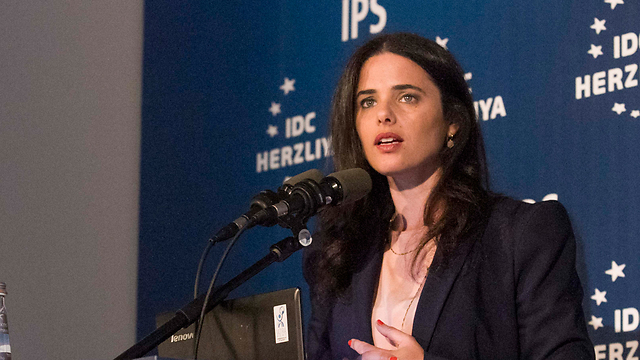 But the focus of frustration for Shaked and her supporters are around 70 whose work focuses on the Israeli-Palestinian conflict and which receive funds either from the European Union as a whole, or individual governments, including Denmark, Sweden, Belgium and Norway. But it is not so much the potential loss of funding that has NGO advocates alarmed, as the message that such legislation sends, even if it doesn't secure parliamentary backing. In a country that has traditionally taken dissent on the chin, the move to clamp down reveals a new, thinner skin, one less accepting of opposing opinion, especially from those regarded as having a left-wing agenda. "There's a sense on the Israeli right that progressive or liberal viewpoints are a danger and that something has to be done about it," said Matt Duss, the president of the Foundation for Middle East Peace in Washington, DC. "It creates a hostile environment for those who express legitimate criticism and would put Israel in some very bad company." It remains unclear how much backing Shaked will get for her bill, but she looks determined to test the waters. NGO Monitor, which has questioned the accuracy of data gathered by groups like B'Tselem, says it does not support any legislation that would punish the NGO community. But its head, Gerald Steinberg, accuses B'Tselem and others of waging "a very dangerous form of warfare" against Israel and says legislation is needed to combat "the destructive European policy of funding political NGOs". Others see a different objective. As rockets continue trickling from the Strip, poll finds half of respondents believe Israel will win next round of fighting with Hamas; 54% see conflict with Hezbollah as likely, with 70% believing Israel will win it. As a trickle of rockets fired from the Gaza Strip continues hitting Israel every few days, 82 percent of Israelis foresee another round of fighting against Hamas in Gaza, a poll released Sunday at the Herzliya Conference found. According to the poll, conducted by Dr. Mina Tzemach and the Midgam Institute for the IPS Institute for Policy and Strategy, half of respondents believe Israel will defeat Hamas in the next round of fighting. When asked whether Israel defeated Hamas in last summer's Operation Protective Edge, half said yes. On the northern front, 54 percent of Israelis foresee a confrontation with Hezbollah, with 70 percent of respondents believing Israel will win. Meanwhile, 42 percent view the Islamic State as posing less of a threat to Israel. In light of the threats Israel faces, respondents were asked what their position on the defense budget was, with 52.2 percent saying the budget should not be cut. Forty percent of Israeli-Arabs also hold that opinion. Another topic asked about is the stalled peace process with the Palestinians, with 68 percent saying Israel should renew talks or present its own diplomatic initiative. Seventy-two percent of respondents support the Arab Peace Initiative proposed by Saudi Arabia, which offers Israel peace with the moderate Arab nations on top of peace with the Palestinians. With regards to this year's elections, 52 percent said they were unhappy with the results that won Benjamin Netanyahu a fourth term as prime minister.